Posted April 30, 2013 in kinetics. As a ten year old, going to the Saturday matinee neighborhood films in the Bronx of the early 1960’s was always a treat for me. The Hammer horror craze was in full swing as well as a plethora of Sci fi and monster films, and a generous supply of Tarzan and Sword and Sandal movies. 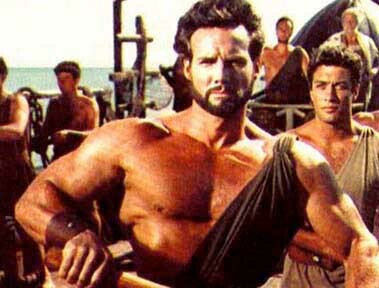 The king of the S&S craze was certainly the great Steve Reeves, who was as handsome as a Greek God and sported a symmetrically classical physique that is even today considered to be the prototype for the modern bodybuilder. As a budding artist, interested in sequential action, I was galvanized by Reeves’ lyrical musculature in motion on the screen. I was also inspired to begin training with weights, as were many others such as Arnold Schwarzenegger and Sylvester Stallone, upon viewing Reeves onscreen for the first time. The Hercules films that Reeves starred in were top box office draws worldwide, and they even spawned a comic book that I was later to discover had been drawn by Marvel superstar artist John Buscema. That artist, who was developing a drawing style obviously inspired by Greco-Roman and Renaissance figure work was nearly perfect for the assignment. Although the melee in the long third panel is well drawn, it could be better arranged in terms of the placement of figures in relationship to one another. The focal point of this panel should be Hercules, but instead the eye goes to the sword wielding soldier or the small figure speaking in the center. If we study this page above from Sgt. Fury #13, we see an almost scientific precision in the relationship between Kirby’s figures, not only within the space of the panel, but in the movement from panel to panel. Every figure on the page is in its optimal position for the balance of the composition, to propel the action as well as the story. Kirby uses the human body in all its kinetic contortions to move the eye precisely where he wants it to go. 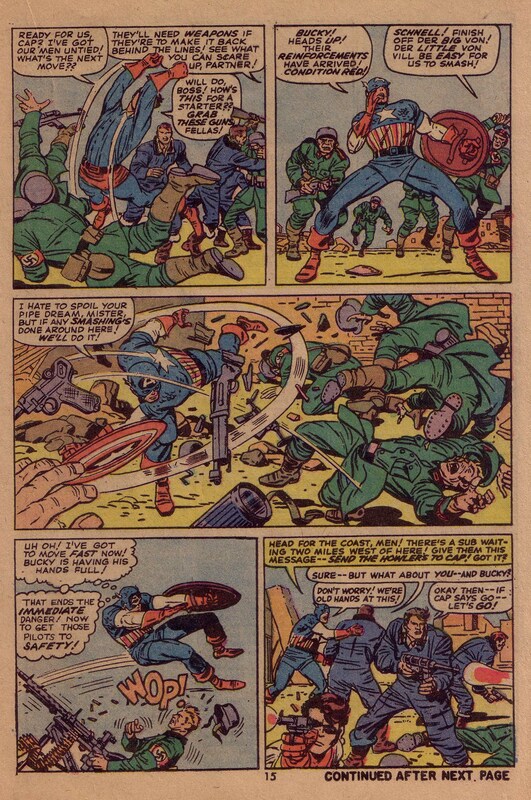 Look for example at the panoramic third panel and notice the relationship of the flying figures to the arc of Cap’s swinging shield. It is almost as if they were arranged in specific coordinate points on a spinning wheel. If we then look above at John Buscema’s art on Conan, we see a great sea change in his compositional abilities. This page from Savage Sword Super Special 1977 is a masterful use of page space by the artist, as he uses various figures and objects to move the eye around. Notice the elbow of the seated cup bearer in the right middle ground of panel one pointing to panel two. Next, see the seated pirate’s hand gesture towards panel three and Conan’s back. That shape mass picks up the diagonal of the table moving the eye to the fourth panel. This is a very Kirby-like way to compose a page. 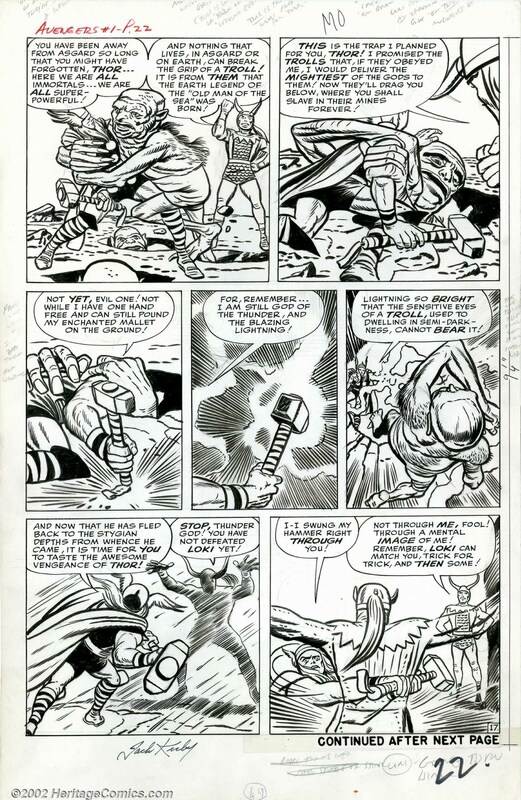 Buscema has learned well, and is using the panel’s contents in a much more abstract manner. As a result, has become both a better artist and a more successful storyteller. 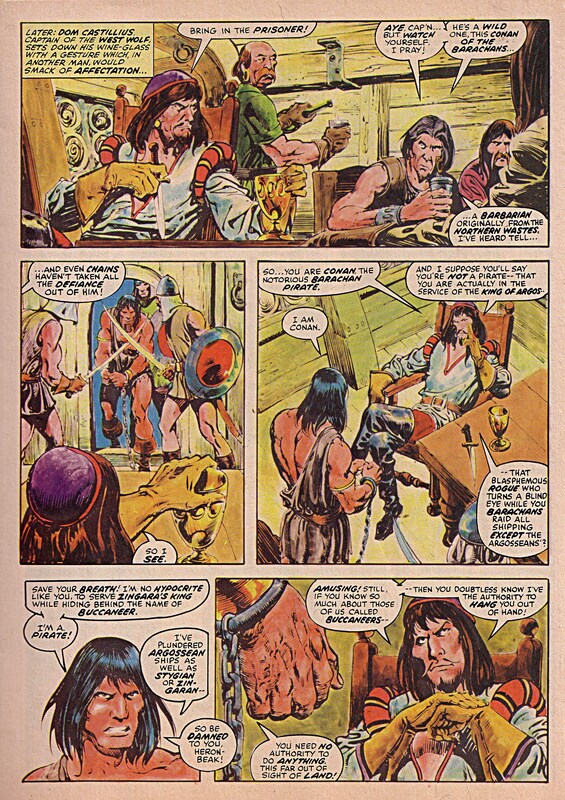 Image 4- Savage Sword of Conan Super Special 1977, John Buscema, Roy Thomas, Alfredo Alcala. Thanks to Rod Beck for the Hercules artwork. Posted April 4, 2013 in kinetics. The cinematographer often uses the King’s forced perspective trick by having much of the action coming out of the screen and towards the viewer. Robert Downey’s Iron Man is also an amusing characterization and Tom Hiddleston’s Loki is appropriately sinister. And this is certainly the case if we compare even the best superhero movie with a Kirby comic. Kirby’s mastery is in the ability to find the peak moment of action as well, which is also why one of his panels is often more dynamic than a live action sequence. When one sees for example, a power hitter connect for a home run, there is a moment where that swing is at its most forceful kinetically, but we are seldom ever able to see that fraction of a second. 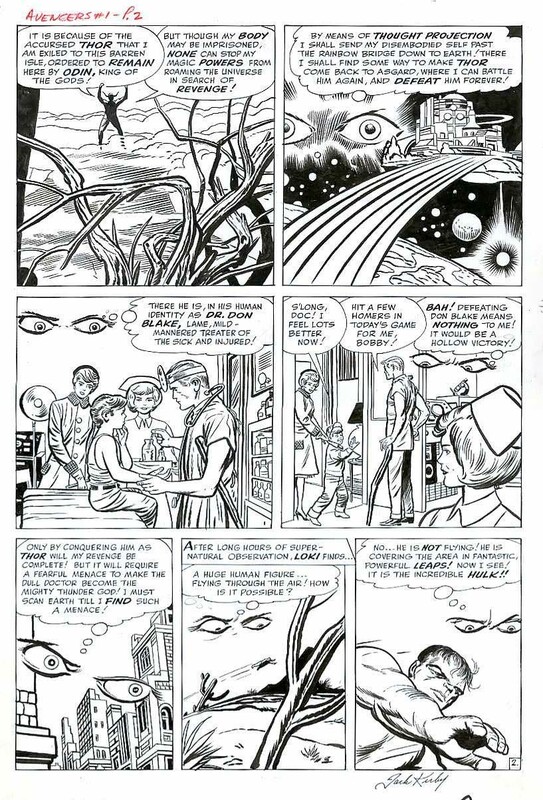 Kirby not only isolates it, he also amplifies it by exaggerating various aspects of human anatomy and perspective. 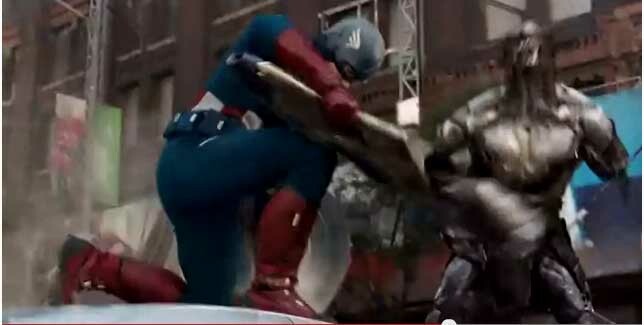 That said, director Joss Whedon does an excellent job with action sequences in the movie. The Avengers film is more or less an updated version of Avengers #1, published in 1963. Basically, the Avengers come together in order to foil a scheme hatched by the insidious Loki. In the film, Loki enlists the aid of some nasty aliens, whereas in the comic he merely manipulates the Hulk and the Avengers into battle with one another, wherein they eventually team up to defeat him. Here, we see page two of the first issue, where Loki tracks the Hulk’s whereabouts as his evil scheme solidifies. Kirby gives us a fantastic view of Asgard through Loki’s roving eyes, which eventually make their way to earth and finally settle on the airborne Hulk. Kirby is the comic book equivalent of the consummate film editor as he weaves his story with masterful panel transitions, and I’ve seldom seen a movie that uses space and time so effectively as his comic art does. Later on page 14, above we see Iron Man briefly face off against the Hulk and the former is defeated. Notice the cinematic nature of the sequence, where the Hulk’s downward motion trail in panel one moves upward in the second panel. The Hulk then leaps away, snarling his distrust. The scene shifts to Asgard, where Thor seeks out Loki with the aid of his father Odin. The following page below is a wonderment of fantasy action that any filmmaker would be fortunate to match, as Thor wrestles with a demonic Troll, casting him into the depths of a pit. The original Hulk as presented in his own 1962 comic as well as in the Avengers’ first issue was a fairly intelligent and shrewd character, but also one seething with rage and resentment. He was so belligerent that he was utterly incapable of being part of a team, and he was out of the Avengers by the third issue. As time went by, he became more and more incoherent, eventually becoming similar to the character that we see in the film, essentially a brainless hunk of muscle. It seems that whenever Kirby was plotting the Hulk, as he did in the 1962 comic and in the first three issues of the Avengers, he made the character intelligent, along the lines of the original Mr. Hyde or Frankenstein’s monster as written by Mary Shelly. As soon as Kirby was no longer plotting the character, the Hulk reverted to a half-witted creature. 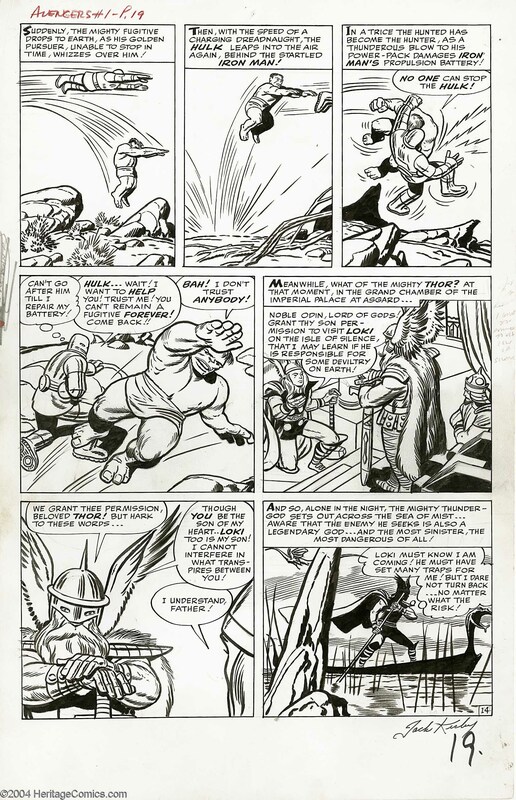 Kirby also plotted the Hulk series in Tales to Astonish beginning with issue #68 and shortly thereafter, the character regained his lost intelligence for a time. In the two Hulk films as well as the Avengers movie, the Hulk is a computer generated image or CGI creation, and is presented as a fairly mindless engine of destruction. I don’t much care for the look or the persona of the movie Hulk. Kirby’s original wily and sinister Hulk is for me a much more compelling and fascinating creature and I would have much preferred to see that character onscreen. Allow me to digress here. One can draw an interesting parallel between the way the Hulk was treated throughout his comic book and film history and the way that Jack Kirby was perceived and treated by Stan Lee and Marvel over time. Kirby seemed to identify with the Thing and the Hulk, characters who, like him were rough edged and uncouth, possessing robust physical strength and animal vitality. It was easy for some to overlook Kirby’s intellectual and introspective side, as did a Herald Tribune journalist doing a 1966 piece on Marvel when he described Kirby as looking “like the assistant foreman in a girdle factory.” It may be a bit far fetched, but my feeling is that Kirby’s urge to make the Hulk intelligent reflected his own desire to be perceived as someone with a mind to be reckoned with. It is easy to see the Hulk emasculated of intelligence in a similar way that being categorized as merely an artist somewhat emasculated Kirby. Many people saw Kirby as a sort of idiot savant, who needed Stan Lee to make his ideas coherent. Artists are often seen as being blessed with god given talent, but few people are aware of the amount of work that is required to hone that talent and the intelligence that is necessary to apply it. In the early days of the Comic book field, the businessmen that controlled the purse strings did not generally give artists much respect. Just as physical power is often perceived as being less threatening without a brain to support it, Kirby as merely a tool to interpret Stan Lee’s ideas became less threatening even in an art form dominated by its visuals. Now, we can clearly see Stan Lee’s margin notes on these Avengers pages. Judging by the account in my last blog entry of Kirby’s delivering some 1962 Hulk pages to Lee, and seeing that some were marked with notes prior to Kirby’s storming out and tearing the pages in half, we can surmise that a similar process has occurred with the Avengers pages as well. That is, Kirby had brought Lee a complete Avengers story to dialog and Lee made notes during his meeting with Kirby for the former’s scripting efficiency. These pages date to more than a year before most comic scholars surmise that the Marvel method went into effect, that being the plotter/artist leaving his own notes in the margin for the scripter to follow. Clearly, at some point it was decided that instead of Kirby coming into the Marvel offices with his plotted artwork for a story conference, it was more efficient to mail the pages with his own notes. If the evidence shows that Kirby was plotting stories prior to meeting with Lee, what reason would we have to believe Lee’s testimony that Kirby was not a major part of the creative process. Obviously, we are dealing with a highly volatile issue here, concerning several parties telling very different stories about a process. We can only look at the evidence, and in this case it appears to tell us that Jack Kirby was plotting and delivering ideas and characters, either from the beginning of his tenure at Marvel or certainly very shortly thereafter. Not only does Kirby’s body of work as a comic book professional verify this, the various people that worked with him over the decades confirm the fact that Jack Kirby had been a primary creative force for as long as he worked in comics. The simple fact is that Disney/Marvel has made and stands to make untold billions from these properties, and they need to recognize and properly compensate Jack Kirby’s estate for his amazing contributions to their empire. Brent Staples quote from New York Times May, 14 2008 The Man Behind Iron Man. Thanks to Patrick Ford and Steven Brower for their assistance.